The Bervie Skatepark committee has been unable to access funding. Volunteers claim they have been unable to start work on a new skate park due to council red tape – three years after they were given planning consent. The Bervie Skate Park Committee has said it was forced to hand back £13,000 in charity funding because Aberdeenshire Council has yet to give them the lease for the site, despite backing the scheme in 2015. Yesterday, the chairwoman of the committee which helped to make the ambition a reality, claimed the village had been left “high and dry” by the authority. Audrey Forbes said: “We have jumped through hoops to get everything sorted out. “We had to give back £13,000 from the Tullo Windfarm fund because you have to use it within a year and we didn’t have the lease. “We’re now in the process of applying for £100,000 and think we would have a good chance of getting it, but we don’t have the lease so will probably miss out. 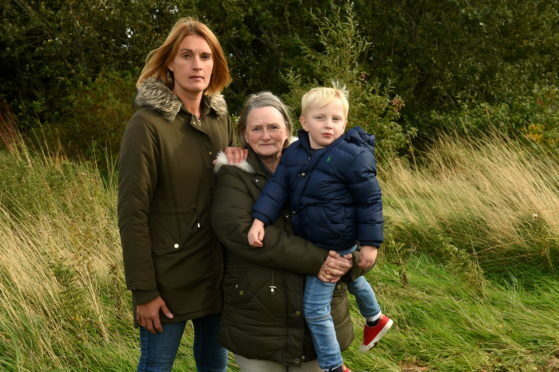 “It would only take about three months to build the park but we’ve had to wait three years with no real answer from the council. Someone has taken a decision in some office somewhere and left us high and dry. “The people of Inverbervie have been marvellous, everyone has supported this and given us money but we’re standing here with nothing. The facility – which would cater for skaters and bikers – would be built in Bervie’s William Eddie Park. Mearns councillor George Carr said he was “ashamed” of the council for failing to move forward more quickly. He said: “It’s disappointing beyond belief that this hasn’t been progressed by now. It was approved in 2015 and council officers were tasked with drawing up a lease for the skatepark. “I’m concerned about the reputational damage this is causing the council, through the failure to deliver something that should be fairly simple. “It’s particularly worrying that a project like this for youngsters and with so many volunteers and community support – something which is right at the essence of Aberdeenshire – has been let down so badly. An Aberdeenshire Council spokesman said: “At the end of June 2015 we agreed in principle to grant a lease to Bervie Skate Park Committee to use land at William Eddie Park, Inverbervie to be used as a skate park once the committee had obtained planning permission and funding for its proposals. “Whilst planning permission was granted in May 2017 we have not yet had confirmation from the committee that the funding has been secured and so have not yet been able to grant the lease.